Heat oven to 325°F. Generously grease bottom, side and tube of 10-inch angel food (tube) cake pan with shortening; lightly flour. In large bowl, beat granulated sugar, butter, eggs and vanilla with electric mixer on low speed 30 seconds, scraping bowl constantly. Beat on high speed 5 minutes, scraping bowl occasionally. On low speed, gradually beat in flour alternately with milk. Pour batter into pan. Bake 1 hour 30 minutes or until toothpick inserted in center comes out clean. Cool 15 minutes; remove from pan to cooling rack. Cool completely, about 2 hours. Sprinkle with powdered sugar. To Freeze: Bake and cool as directed. Wrap cake tightly in plastic wrap; wrap loosely in heavy-duty foil. Freeze up to 1 month. Thaw at room temperature. Who said baking has to be complex? Not Betty! 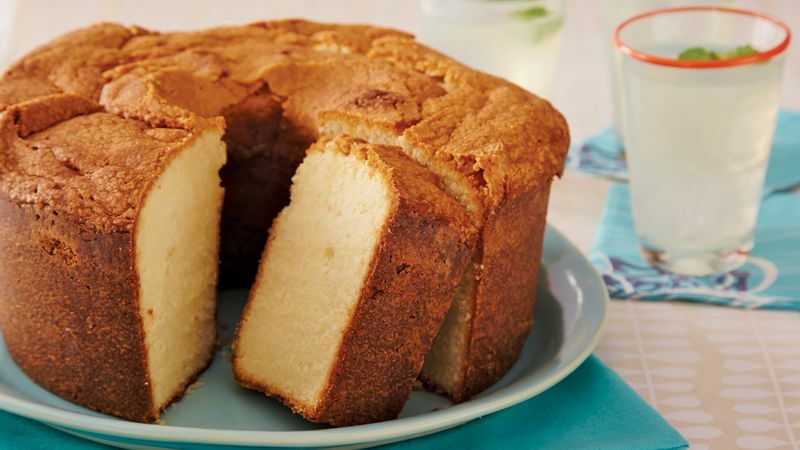 This pound cake shockingly only takes two steps and 15 minutes to prepare, making it one of Betty’s easiest pound cake recipes. And the fact that it’s just six ingredients makes the recipe even easier (and — bonus! — minimizes dishes). The most important ingredient in any pound cake is the flour, so don’t be surprised that you need to use a whopping four cups — it needs an ample amount in order to give it that dense consistency. And no matter how easy the recipe, you can always check in on Betty’s best tips for baking cakes.